Develop barges/vessels with reduced production costs and weight by the use of a new structural construction concept allowing more automated production, reduced dimensions in shell plating and a reduced number of structural components. Develop barges/vessels with improved cargo handling thereby reduced dead time in port combined with advanced logistics solutions. 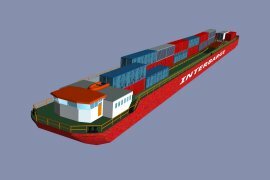 Develop barges/vessels with maximized cargo capacity and payload for their size and the physical limitations of the river/waterway system. Develop low polluting and low consumption barges/vessels by lowering the light ship weight, taking advantage of low resistance optimized hull shapes and state-of-the-art propulsion systems. 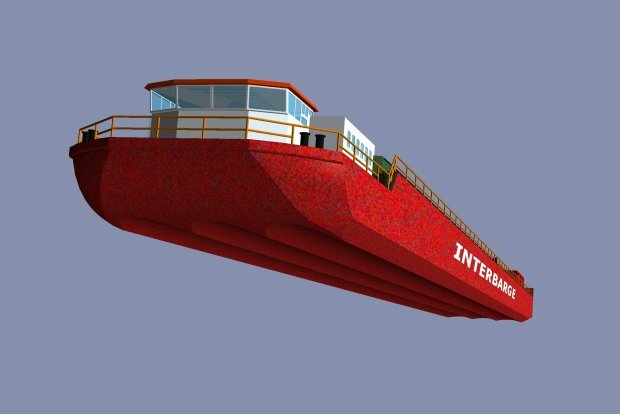 The INTERBARGE project brings new elements into several key areas of vessel design which is vital for an efficient and economical way of transporting cargo on the inland rivers/waterways of Europe. The illustration below shows how the innovative elements of INTERBARGE will bring cost and time reductions in several areas. This project was evolved from the idea of utilizing a structural concept with great potential for the construction of an inland waterway vessel. The basic concept is taking advantage the inherent strength capacity of a plate after the bending resistance limit is exceeded. This can be done by giving the shell plating a specific curvature and that transforms bending stresses into membrane stresses which will give a general drop in stress level. An efficient system of handling cargo at terminals, inside vessels and in transfer vessels/terminals is crucial for the competitiveness of river/waterway transport compared to other transport modes. 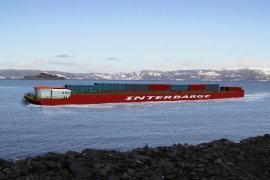 INTERBARGE vessels/barges will be designed to meet the latest technologies of cargo handling and also contribute to the development and utilization of efficient new systems. The Improved Port Ship Interface (IPSI) system is one such technology representing the latest of RoRo unit cargo handling both at terminals and for adaptation to ships and other transport modes. Hamworthy KSE will contribute to the implementation of IPSI technology in the INTERBARGE project.